Sangria is one of my favorite party drinks to make during the summer. Usually, you’ll see sangria made with red wine, and it is a fantastic way to make a cheap bottle of red taste a whole lot better. Red wine isn’t the only option for sangria, however, because white wine can make a fantastic sangria as well. When I make sangria with white wine, I like to use different fruits than I would put in red sangria. In red sangria, you need strong flavors like oranges, since the wine is potent and will dominate more mildly flavored fruits. In white sangria, you can opt for softer fruits and flavors will really shine. One of my favorite combinations to use is mango and peach. They both have sweet, floral aromas that really compliment the wine and come through in the finished drink – not to mention that they give it a very refreshing, tropical flavor! You can use either mango or peach juice when making up your own batch. I prefer to use mango juice (and if you really want a shortcut, you can find canned and jarred mangos packed in juice at some supermarkets) because I really love the flavor of it. Peach juice may be slightly easier to find and does just as nice a job of sweetening up the drink. The sangria will be ready to drink just as soon as you finish mixing it up, however the flavors will meld over time and it will taste even better the day after you make it – if you can wait that long to pour yourself a glass. You can use any kind of white wine to make this sangria, and an inexpensive bottle is usually a good choice. If you are going out to pick up a bottle instead of using what you have around the house already, I really recommend choosing a wine that doesn’t have a strong oak flavor (like some chardonnays), since the fruit will pop more in an un-oaked wine. Pinot Gris/Pino Grigio and Sauvignon Blanc are definitely my favorites for a sangria like this one (and I almost always opt for Sauvignon Blanc when I can). 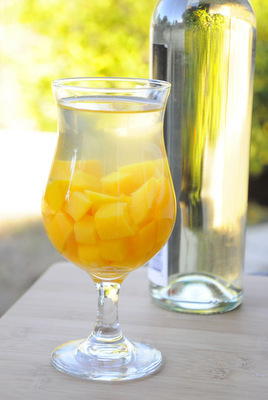 In a large bowl, or a large pitcher, combine wine, mango juice and sugar. Stir well until sugar is dissolved. Add in the diced fruit and triple sec.